In my last couple of articles (Part 4, Part 5), I demonstrated a logistic regression model with binomial errors on binary data in R’s glm() function. But one of wonderful things about glm() is that it is so flexible. It can run so much more than logistic regression models. The flexibility, of course, also means that you have to tell it exactly which model you want to run, and how. In fact, we can use generalized linear models to model count data as well. In such data the errors may well be distributed non-normally and the variance usually increases with the mean values. As with binary data, we use the glm() command, but this time we specify a Poisson error distribution and the logarithm as the link function. The natural log is the default link function for the Poisson error distribution. It works well for count data as it forces all of the predicted values to be positive. In the following example we fit a generalized linear model to count data using a Poisson error structure. The data set consists of counts of high school students diagnosed with an infectious disease within a period of days from an initial outbreak. 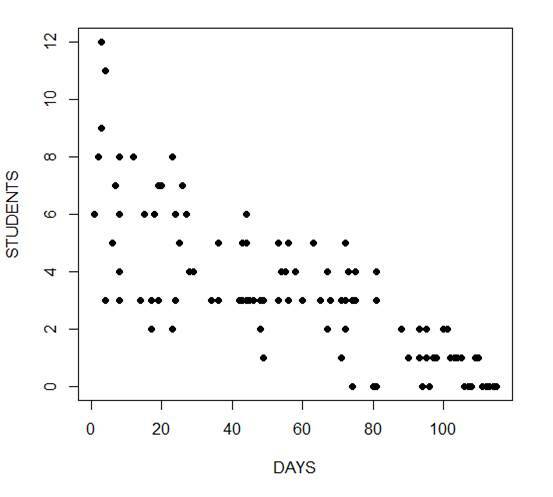 0L, 1L, 1L, 0L, 0L, 0L, 0L, 0L)), .Names = c("Days", "Students"
The mean and variance are different (actually, the variance is greater). Now we plot the data. Now we fit the glm, specifying the Poisson distribution by including it as the second argument. The negative coefficient for Days indicates that as days increase, the mean number of students with the disease is smaller. This coefficient is highly significant (p < 2e-16). We also see that the residual deviance is greater than the degrees of freedom, so that we have over-dispersion. This means that there is extra variance not accounted for by the model or by the error structure. This is a very important model assumption, so in my next article we will re-fit the model using quasi poisson errors. See our full R Tutorial Series and other blog posts regarding R programming. About the Author: David Lillis has taught R to many researchers and statisticians. His company, Sigma Statistics and Research Limited, provides both on-line instruction and face-to-face workshops on R, and coding services in R. David holds a doctorate in applied statistics. In this comment is Students variable follow IID Poisson random variables?? Atik, tecnhically it’s Students|Days is assumed to follow iid Poisson. That assumption would have to be checked. i want to know the code for poisson regression for count data set without using inbuild function i.e glm() function. I would like to know that, too. I’m with Robert, why is it greater? In my R Companion textbook, I found another way to test for overdispersion. If you divide Residual deviance / residual df and the value is above 1.5 (which is generally considered the threshold), you should use a quasi model. In this case, it would be 0.945. Please know that I’m looking at similar models, but using logistic regressions (for which the answer may be slightly different). Best! I don’t have understand what you said.